When you think of the iconic Judy Holliday, the immediate visual is of that dumb blonde Billie Dawn in Born Yesterday for which she received both an Academy Award and Golden Globe for Best Actress and on Broadway in Bells Are Ringing (Tony Award). That Brooklyn/Bronx squeaky style shrill ditzy blonde brought a treasure trove of laughs. Little did we know she was a smart, clever, high IQ (172) mostly hidden in her professional persona but very much evident in her private life. 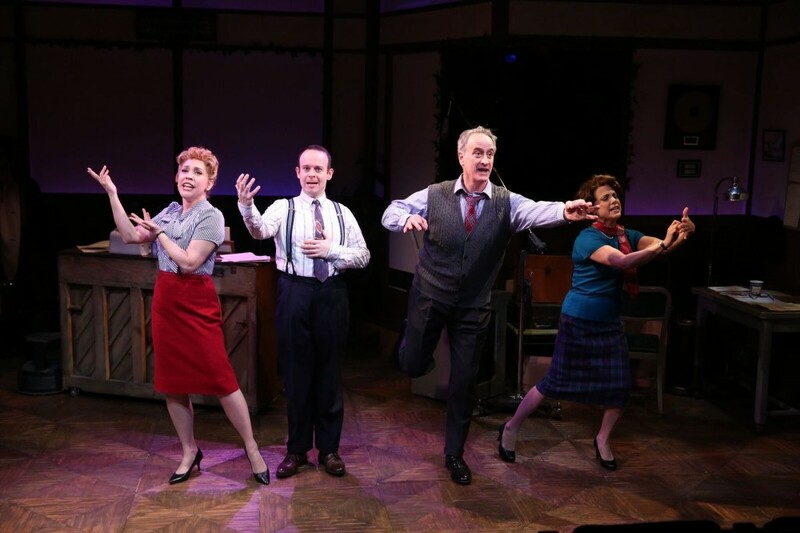 Willy Holtzman has written this play sprinkled with many of our favorite tunes, to reveal the multi-talents and multi sides of Judy Holliday, born Judith Tuvim (a Hebrew name that literally in Yiddish means ‘holidays’). She came up with that last name at the beginnings of her show business career when she was part of an act, The Revuers, along with Betty Comden, Adolph Green, Alvin Hammer, John Frank and Esther Cohen. They worked at the Village Vanguard and Blue Angel in New York (among other clubs) and in Hollywood at the Trocadero where she met Adolph’s roommate Leonard Bernstein. 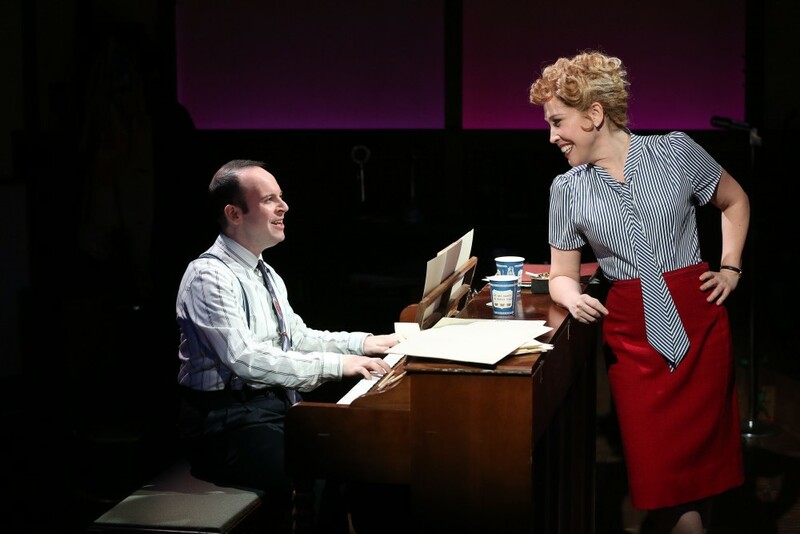 Although this production begins slow paced in a sound studio with Judy (played with charm, talent and gusto by Andrea Burns) attempting to sing “What’s the Rush” (Gerry Mulligan and Judy Holliday), it resolves into the backstory (maybe not quickly enough) that is the heart and meat of Smart Blonde. Holliday was interrogated in 1950 having appeared in the “pro-Communist” publication Red Channels. Advised to play dumb (an easy task just reinventing Billie Dawn), the investigation revealed no evidence of membership in the Communist Party. All these scenes are portrayed, giving remarkable insight into the life and world of this famous actress, comedienne, singer. Throughout, we’re treated to songs that are interspersed at the right moments, i.e. : “I Can’t Give You Anything But Love” (Fields/McHugh); “Let’s Fall in Love” (Koehler/Arlen); “What’ll I Do” (Berlin); “I Wanna Be Loved By You” (Stathart, Kolmar, Ruby). When Holliday was chosen to play Laurette Taylor in a production slated for Broadway, she became ill and had to leave in 1960 and the show closed in Philadelphia. In 1965 (two weeks short of her 44th Birthday), she died of breast cancer. The play is accomplished on a small single set that portrays everything from the sound studio to a kitchen, office and nightclub designed by Tony Ferrieri. 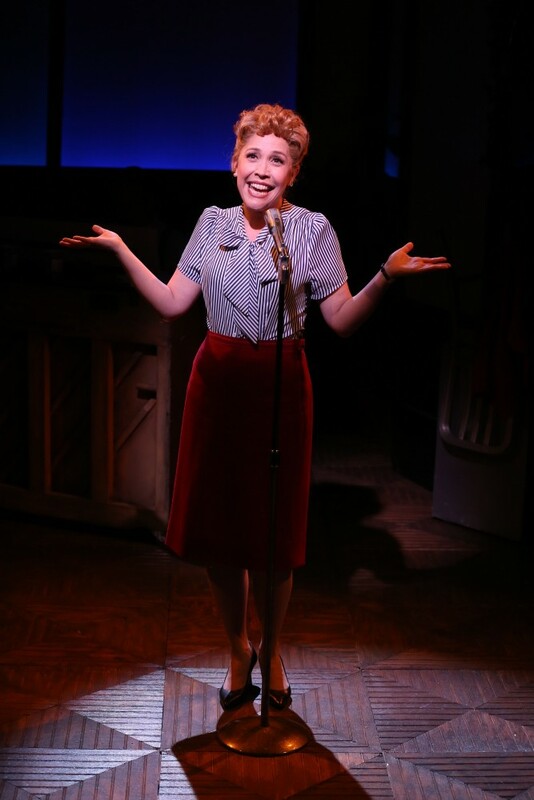 The time-era costumes of the 40s/50s are created by Michael McDonald. 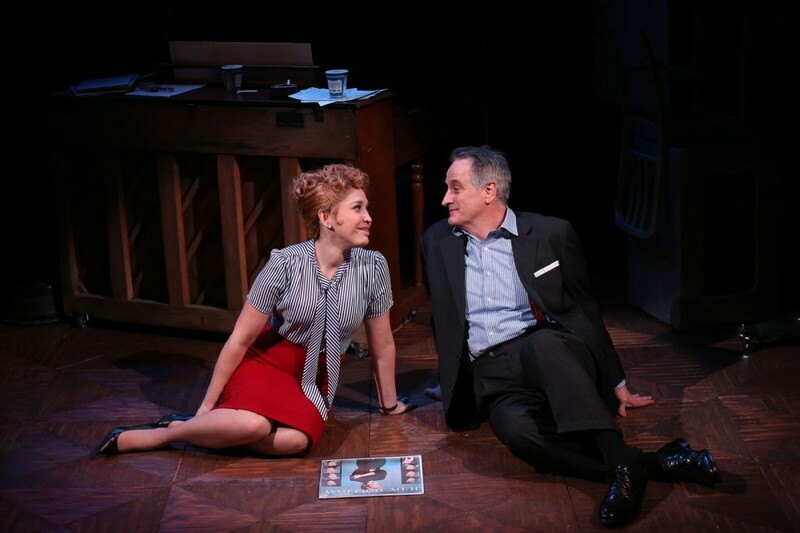 But, most of all, is how you’ll be caught up in the engaging performances, beautifully directed by Peter Flynn, and the star quality of the well-chosen Andrea Burns as Judy Holliday.